Many thanks to my dear friends and colleagues for their warm words. "Versatile, dynamic and different stage experience"
"Mr. Roni Porat appears regularly with the Israel Philharmonic Orchestra in our Concert Series for Young people. His unique and novel approach, has brought him wide critical acclaim by the public and musicians alike. Mr. Porat created a new concept in which he writes, acts and conducts. In his own special way, Mr. Porat forms a versatile, dynamic and different stage experience which deserves to be presented to wide audiences. I warmly recommend him to any musical organization." "My admiration and love to what you have accomplished"
"...this is just an expression of my admiration and love for what you have accomplished, and what you are giving to the world. It will be a long time before the world has repaid you for your extraordinary passion and for the magnificent gift that you are." "Roni Porat and The Israel Stage Orchestra shared with us, hundreds of avid listeners - children and parents - a magical hour. It was a combination of music, theatre, education, general knowledge, music appreciation and a large dose of personal charm and charisma. Without any obvious effort, without burdening his young audience, or being didactic Porat imparted a fund of knowledge in such a way that young and old alike absorbed the information and enjoyed the experience. Above all I enjoyed the fact that Porat approaches his young audience at the highest possible level - with the utmost respect for language and for their ability to comprehend. 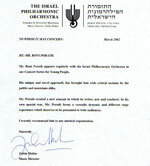 Porat's concerts are a refreshing cultural experience." "One of our world’s rarest and most precious commodity"
"I first saw Roni Porat conduct an orchestra in the Mann Auditorium in Tel Aviv, during a concert for youth that was part of the Israel Philharmonic’s Family Series. I was with my four and a half year old son, who couldn’t get his eyes off the whacky, eccentric, energetic, sympathetic character waving his arms around with his back to this audience, in between juggling, joking, storytelling, dancing and other antics. ‘what’s he doing?’ asked my son. ‘but, he’s so nice’ said my son, with a bewildered look on his face. ‘yes, he is, very..’ said I, thinking to myself: nice is the understatement of the year. Now that I know Roni personally, and after having listened to his original compositions, watched him on stage in a crazy cabaret and met with him to discuss music and life, I am convinced my son’s sweet summary was the understatement of the year. Musicians like Roni, or should I say, people like Roni, are exactly our world’s rarest and most precious commodity. I am proud to know him, look forward to working with him in the future, and hold him the highest possible esteem. I can only wish him the very best of everything, wherever his beautiful soul may take him."